The Dread Pirate Mousert is a breed of mouse found in the Sunken City. It is known to drop Barnacles and Sand Dollars as loot. A legendary pirate who strikes fear into all of his foes for he takes no prisoners. Some believe he is immortal, others suggest such a thing inconceivable and state that he is merely different mice playing up a pseudonym. Whatever the case, we know he is in the pirating business for all the sweet Barnacles! Or was it to rescue Princess Barnacle? No wait... Well, anyway, if you catch this mouse you probably won't be able to get him to talk... or was that to get him to STOP talking...? Either way, you will have the upper hand because we know he is left-handed! ...Probably! The Dread Pirate Mousert has no specific preference for any kind of cheese. The Dread Pirate Mousert is susceptible only to Hydro weapons. It can be found in the Shipwreck zone while on a Dive in the Sunken City. The Dread Pirate Mousert drops the Barnacle Egg during the annual Spring Egg Hunt. 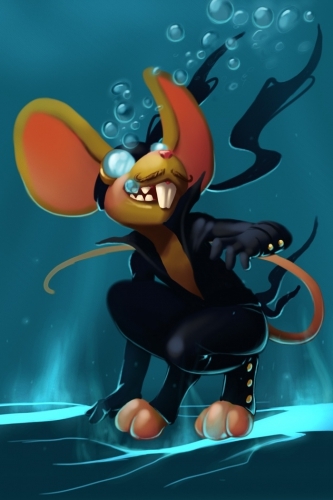 The Dread Pirate Mousert Mouse was released 2 July 2014 as part of the Sunken City content. This mouse's name and description are references to The Princess Bride. This page was last edited on 27 May 2017, at 01:25.